Before applying for funding (by submitting a project proposal), all organisations (partners) involved in the project must first be registered with the Commission. To do so the organisation must register for a Participant Identification Code, or PIC, a unique code that identifies an organisation. More information on this can be found in the Portal FAQs and User Guide. One can also visit the IT helpdesk to for answers to your questions about the Participant Portal tools and processes. On completing registration, you will receive a 9-digit Participant Identification Code (PIC) – to be quoted in your proposal and in any correspondence with the Commission. Furthermore remember that if you intend to name another organisation as a partner in the application form, they also must have a PIC. If someone creates a new PIC for your organisation while you already have one, your LEAR or Account Administrator should contact the Validation Services via the messaging tool in the Beneficiary Register (My Organisations page on the Participant Portal) so that they transfer any information related to this duplicate PIC to the correct PIC. Applicants can choose to fill in the applications in English or in Maltese. Click here for more information about all the upcoming deadlines. There are a number of different requirements that an organisation must fulfill before applying for Erasmus+ funding. In order to understand the funding rules and eligibility criteria it is essential that reference is made to the Erasmus+ Programme Guide, a tool for anybody who would like to have a thorough knowledge of what the Erasmus+ Programme is about. 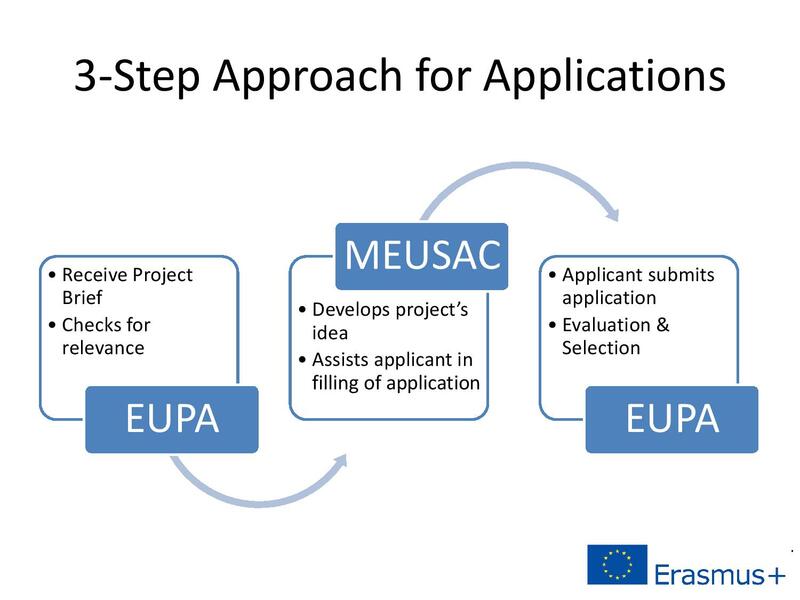 EUPA are recommending a 3 step approach for project applications. The EUPA is offering a service where the project proposal according to secotor (KA1 or KA2), is sent to the Programme Coordination and Communications Unit (PCCU) within the EUPA for their review at least one month before the deadline. Following this review, feedback may be given to ensure that the project application is in line with European and Maltese priorities. Moreover, the PCCU may refer the applicant to MEUSAC for assistance in the formulation of application and to further develop the project idea. The National Priorities for the Erasmus+ programme can be downloaded from here. Other areas that are not mentioned as Priorities may still be considered by the Projects Evaluation Committee. The General Conditions for Monobeneficiary and Multibeneficiary projects can be found here. The Online Linguistic Support provides participants in Erasmus+ long-term mobility activities (Key Action 1) with the opportunity to assess their knowledge of the language they will use to study, work or volunteer abroad. Download Online Linguistic Support Guide. Please note that applications addressing more than one field are still eligible to apply however applicants need to identify which sectors will be most impacted and choose from the above applications accordingly. The European Commission released the Accreditation (for HEI Consortia, VET organisations and EVS) and Key Action 1 (mobility of individuals) forms in relation to the Erasmus+ programme for Education, Training, Youth and Sport (2014-2020). A mandate is a bilateral agreement between the coordinating organisation and each partner organisation taking part in an Erasmus+ project by which the partner organisation authorizes the coordinating organisation to act on its behalf in matters related to the project implementation. by organisations applying for VET learner and staff mobility with the mobility charter. For grant support to travel costs in the Erasmus+ Programme, travel distances must be calculated using the distance calculator provided in the link below. The National Agency provides pre-financing payment to beneficiaries after the Grant Agreement is signed by both parties (the beneficiary and the National Agency). Pre-financing is intended to provide the beneficiary with a float. The first pre-financing payment may be split into two or more instalments, depending on the type of action that the project is addressing (Key Action 1, Key Action2, or Key Action 3 in the Youth Sector) as well as the result of the risk assessment conducted by the Agency. The interim and final payment will be disbursed by the National Agency on the basis of the analysis of reports and payment requests submitted by the beneficiary. The beneficiary is advised to refer to the section ‘Payment Procedures’ in the Erasmus+ Programme Guide which is published annually by the European Commission for further details. Once you become a beneficiary of the Erasmus+ Programme, you will become a user of the Mobility Tool+. Download Mobility Tool+ Guide for Beneficiaries. A step by step guide for beneficiaries on how to submit a final report. A step by step guide for beneficiaries on how to add a mobility. A step by step guide for beneficiaries on how to export and import mobilities. A step by step guide for beneficiaries on how to read the error log. A step by step guide for beneficiaries on how to work with a CSV file. The KA2 beneficiary shall input the deliverables of the Project in the Erasmus+ Programme Dissemination Platform here in accordance with the instructions provided in the Dissemination Platform. The approval of the final report will be subject to the upload of the Project deliverables in the Dissemination Platform by the time of the submission of the final report. The European Commission has produced a guidance document for beneficiaries Erasmus+Project Results Platform Guide for Beneficiaries on how to use the Erasmus+ Project Results Platform. Beneficiaries of European Union (EU) funding are obliged to display the EU flag and to acknowledge the support received under the relevant EU programmes in all communication and promotional material. Click here for further information.